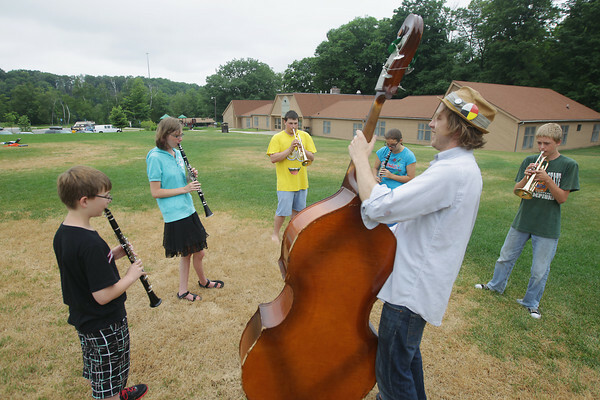 Brennan Andes, of Ann Arbor, plays a double bass as he leads a group workshop Tuesday, July 9, 2013 during the SEEDS School of Rock camp at Twin Lakes Camp in Long Lake Township. A concert by camp students followed by musicians from Earthwork Music collective (who taught during the camp) is planned for Thursday beginning at 7:00 p.m. at the City Opera House. Funds raised from ticket sales for the event are for SEEDS School of Rock scholarship. For more information regarding tickets visit http://www.ecoseeds.org.